This Spring game was by far one of the cleanest and well coached games that I have seen. Both Agner and Tronti reminded me of Driskell and his smooth operation of the offensive system. The Defense looks way better, hungrier and the schemes seem to fit the athletes that we have. I believe this year our defense will be one of our strengths as we will be able to get needed stops. Spencer has a lot of experience and this unit looks like they are already on the same page. The problem with the O is even if we run the system Driskell thrived in we don’t have motor. The Jet sweep with Willie right should be eliminated from the play book. We need consistency and the wins will show up. Some players need to step up like Bryant who for sure will get draft notoriety. Last year was a missed chance because we were not disciplined, but I see a solid 6 wins right now if the defense make the stops and I like 9 wins if the offense gets the ball rolling. Robison creates a problem with us moving forward. No doubt if he gets his act together his talent can really help but who knows. I could list dozens of time that play has worked over the last two years. You do not get rid of bread a butter play that has a history of success because our WRs don't block it. Agreed! Do not get rid of it but use it more judiciously (only vs. certain D's), and maybe even with other receivers to make it less predictable! I have seen holding calls on way too high of a percentage of that play. Our o will need to find out what works and keep doing it. This will be Charlies year to prove he is a genius. He did in 2017, 2018 and will this year. Plays are ran for many reasons…some to keep the defense honest. Some to play to strengths (or weaknesses) of your offense. Some to set up a different play that series or maybe even later in the game. Think of it like boxing. There are faints and check punches thrown. Not all are intended to knock the opponent out nor do they score every time its thrown. It's a chess match. Lastly, remember just because we ran something that didn't work last year doesn't mean you stop. It means hopefully we have the coaching and players trained and skillful enough this coming year to execute it. Our offensive line from a run blocking perspective wasn't very good last year guys. It caused a ton of our issues. 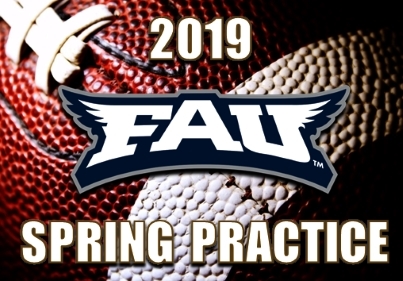 The FAU football team took to the practice field Tuesday morning for the first of their final three practices of the 2019 spring. The day was filled with individual work with a mindset of correcting mistakes made in Saturday’s Spring Game, and repeating positives that also came out of last Saturday’s game. What did you see from the quarterbacks on Saturday? The Florida Atlantic University football team held their final practice of the 2019 spring on Thursday and the Owls have just one event remaining prior to their spring semester final exams, a Saturday scrimmage. The Owls practiced in shorts and held to their full Thursday practice schedule, taking advantage of yet another uncommonly pleasant spring day with sporadic cloud cover, temperature in the low 80’s and a slight breeze. While the practice seemed longer than normal, the Owls moved through several team sessions focusing on situations. There was success on both sides of the ball, but the loudest celebrations were on the defensive side of the ball. The team will then hold its final scrimmage game of the spring at 12:30 PM Saturday, April 20th. That session will be closed.